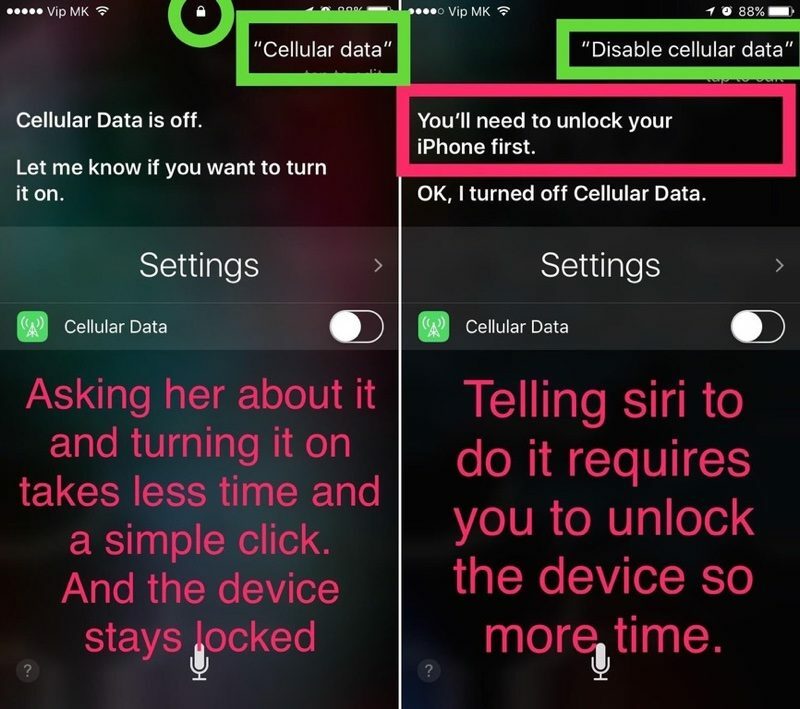 A reddit user has discovered what appears to be a Siri-related bug that allows access to a locked iPhone's Cellular Data options without a passcode. As shown in the screenshot below, when Siri is asked to bring up Cellular Data settings (or if Cellular Data is on), an option to toggle the feature off appears on the lock screen, with no passcode required. When Siri is specifically asked to turn off Cellular Data, the personal assistant asks for a passcode first. Given that a passcode is required when asking Siri to disable Cellular Data, it seems that this is meant to be the default behavior and that it's not a setting meant to be controlled from a locked iPhone. It's questionable if this bug has any real impact, though, as there are other ways to disable cellular service on an iPhone that's been stolen, including turning on Airplane Mode from Control Center or simply turning the iPhone off. MacRumors tested the Siri command and found that it worked on iOS 9 and all versions of iOS 10, including the most recent iOS 10.3.3 beta. For iPhone owners worried about unauthorized access to their iPhones, both Siri and the Control Center can be disabled on the lock screen. There is a lock icon circled in green in the first image, and it isn't visible in the second. Seems likely to be a non-issue. The phone was unlocked by Touch ID when Siri was invoked. I tested it with multiple locked iPhones. It can be disabled without unlocking the iPhone. not a big deal. you could just remove the sim card. or the fact that if it's on AT&T wouldn't make a difference. Or, like the article states you can just turn it on airplane mode via control center... sounds like a "who cares"
I care, because that's exactly why i disabled Control Center on the lockscreen. Not working for me. If I ask Siri, it tells that I need to unlock my phone first. I do not get the toggle option on the lock screen. Just say to Siri, "Cellular Data" that's all. 2 words. It's a big deal because people can turn off cell data without the phone owner knowing. Imagine in a emergency trying to use your phone and not having cell data or whatever. It's an issue even if it's not for you. And most people don't easily know to to re-enable the cell data to be on, unlike airplane mode which shows a airplane icon. Any reason why this is a big deal? It's not, but Apple should fix it anyway. The functions of Siri should be consistent.